Biodegradable metals have an extremely important part to play in healthcare since they are designed to dissolve in vivo, and without eliciting a negative response in the host. Magnesium is a very useful candidates for such applications since it is already an essential trace element and has a very low thrombogenicity and well-known biocompatibility. Biodegradable metals (BMs) are metals and alloys expected to corrode gradually in vivo, with an appropriate host response elicited by released corrosion products, then dissolve completely upon fulfilling the mission to assist with tissue healing with no implant residues. Biomaterial implants can either be used to replace a diseased part or to assist in the healing process. While the former application requires implants to stay in the body permanently, the latter application only requires that the implant remain in the body temporarily. Thus, in situations where a permanent implant is used for a temporary application, additional surgeries are required to remove these devices once the healing process is complete. This removal process increases the cost and patient morbidity. In contrast, biodegradable materials dissolve after the healing process is complete and thus, no additional surgeries are required for removal of these implants. This also eliminates the complications associated with the long-term presence of implants in the body. Lastly, once these materials degrade within the body, it is important that the degradation products are able to be metabolized by the body, and thus bioabsorbable. Magnesium is attractive metal for biodegradable implants because of its low thrombogenicity and well-known biocompatibility. It is an essential trace element and has a high systemic toxic level which is about 7 to 10 milli mols per liter of serum . The use of magnesium as a biodegradable stent material was also based on the fact that it is a structural constituent of the tissue and essential element in the living organism. Magnesium is a substantial intercellular cation which is involved in more than 300 biological reactions of cell. Magnesium is also regarded as a non-carcinogenic element . However, magnesium has a rapid degradation in aggressive chloride environments like body fluid. Rapid degradation of magnesium implant results in tissue overload with degradation products and this can lead to neointimal formation. Accelerated degradation of magnesium can also cause the loss of mechanical integrity in a short period which can limit its application as an implant material. Therefore, magnesium is alloyed with other elements such as aluminum, manganese and rare earth elements in order to decrease the degradation rate. The first application of magnesium in cardiovascular applications dates back to the year 1878 when Huse used a Mg wire ligature successfully to stop bleeding vessels three times: once in a radial artery and twice in the operation for varicocele. Later in the 20th century, magnesium was used in several investigations as biodegradable material for connectors for vessel anastomosis and wires for aneurysm treatment. However, Heublein et al. were the first to investigate the idea of using magnesium alloys for cardiovascular stents. They selected AE21 alloy which has lower degradation rate compared to other magnesium alloys for an initial coronary animal study. The alloy was expected to have up to 50% mass loss during the first half-year of the implantation. The experiments were performed by implantation of stents into the coronary artery of eleven domestic pigs and the follow up procedure was performed at 10, 35 and 56 days after implantation. The histological analysis showed that AE21 magnesium stent induced a neointimal response, but this disadvantage was offset by later positive remodeling. There was not also any platelet deposition or thrombus at the endothelial sites after any of assessment intervals. Furthermore, a negligible inflammatory response was observed on evaluating each strut. The problem of AE21 stent was that its degradation occurred faster that the expected rate as the loss of mechanical integrity occurred between 35 and 56 days after implantation. As mentioned above Mg based BMs are attractive for biodegradable implants because of their good mechanical properties and biocompatibilities. Promising Mg alloying systems including Mg–Ca, Mg–Sr, Mg–Zn, Mg–Si, Mg–Sn, Mg–Mn, Mg–RE and Mg– Ag have been developed. The microstructures, mechanical properties, degradation behavior, ion release, in vitro and in vivo animal biocompatibility studies and clinical trials have been widely explored in order to evaluate their feasibility for biomedical purposes. 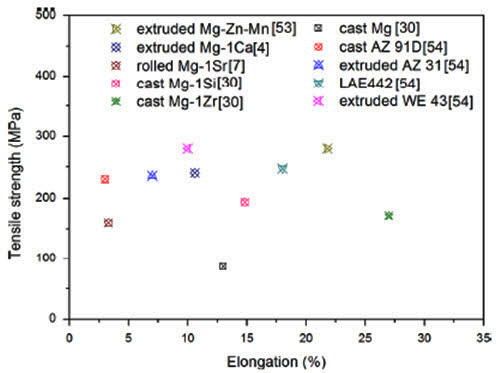 Figure 2 shows the tensile properties of magnesium alloys, including pure Mg, Mg–Zn–Mn, Mg–Ca, Mg– Sr, Mg–Si, Mg–Zr, AZ91D, AZ31, LAE442, WE43. It is quite clear that magnesium alloys have a large range of ultimate tensile strength (UTS) and elongation to failure (EL), from 86.8 to 300MPa and from 3% to 30%, respectively. Alloying and processing history have great effect on the mechanical properties of magnesium alloys. Adding Sn, Si, Zr and Zn can improve both the UTS and EL , while Ca, Sr and Mn will deteriorate their ductility to some extent. Processing deformation (including hot rolling, hot extruding, and ECAP) also contribute to the strength and elongation of magnesium alloys.